Many here would probably add to the accolades. Koren is not the part-time célébré who drops in during warm-weather months. New Yorkers like to identify him as a humorist of the Upper West Side, but Vermonters can easily claim Koren as one of their own. He has lived year-round in the tiny town of Brookfield for 33 years. With his wife, Curtis Ingham Koren, he has a Vermont-born son, Ben, now 22. The elder Koren, at 75, still volunteers with the town’s fire department. 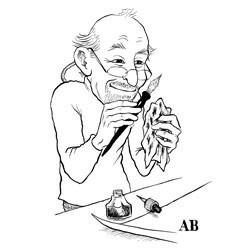 Among the many books he has illustrated are some produced by Vermont’s Chelsea Green Publishing. Koren has contributed pro bono artwork to many a Vermont nonprofit and favored establishment; a quilt made from T-shirts bearing his illustrations greets visitors at the entrance to the Fleming exhibit. Three tees made for Montpelier’s Onion River Sports hint at his love of biking the state’s rural roads. If his capricci are the stuff of fevered fantasy, most of Koren’s cartoons and illustrations do obey the “rules of art,” as well as those of anatomy, whether or not it is hidden behind a pelt or adorned with complicated antlers. Viewers may focus on the meaning, the joke, but they should not overlook the artist’s impeccable grasp of his graphic genre’s essentials. Koren himself confesses he’s not sure where the line is, if it exists, between cartoon and art (see interview below). Without doubt he belongs to a respected visual-art-as-commentary lineage. “He is a satirist of society’s pretension like his 19th-century French and American precursors, Honoré Daumier and Thomas Nast,” writes Fleming curator Aimee Marcereau DeGalan in Koren’s bio for the show, “and, like them, he deftly explores the neuroses of his times.” In addition — and perhaps this characterizes a more modern man — Koren’s work is often reflective, autobiographical. He doesn’t skewer what he calls the “endless peccadilloes” of the self-absorbed so much as he gently observes that we are all very silly humans. Given the hard-edged humor in vogue today, some may find Koren’s too soft, or safe. One New York Times critic, who reviewed “The Capricious Line” at Columbia, chided him for not being sufficiently critical. 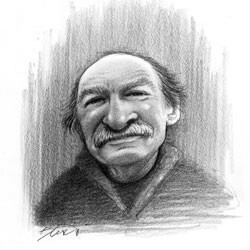 “Considering the kinds of controversial subjects that comic artists like R. Crumb, Art Spiegelman, Daniel Clowes and others have addressed, Mr. Koren seems awfully timid,” writes Ken Johnson in the May 2010 piece. “Woody Allen’s world is Tolstoyan by comparison.” But within his comfort zone, Johnson allows, “Mr. Koren can be funny, psychologically acute and philosophically provocative.” He also applauds Koren’s “pitch-perfect feel for gag lines” and his distinctive cartooning style. “It’s worth visiting this show just to see the full-scale ink drawings on fine, heavyweight paper,” Johnson remarks, as compared with the relatively minuscule New Yorker versions of those cartoons. This is certainly true. Viewers may be surprised to see how large the originals are — the framed works are 20 by 25 inches and up, and the exhibit organizes them both chronologically and categorically. While the cartoon texts elicit chuckles, the size of the drawings invites closer observation of the artwork, calling attention to composition, quirky little details and Koren’s use of visuals to convey concepts. Consider the mice cartoon. The graphic composition is strong: a stage in the lower right foreground, with stadium seating whooshing to the upper left; hundreds of precisely placed, tiny lines of ink to portray mice in a way that is both realistic and, well, cartoony. It’s funny, first of all, in the way that only animals representing humans can be — animals talking, sitting like people or standing upright despite the possession of four legs. It’s funny that the parental mice have so many offspring, they’ve had to rent a theater to gather them all for their announcement. Verbally, though, the cartoon is a punch in the stomach, and you don’t have to be from a “broken home” to imagine the devastation of kids whose parents are getting divorced. Even when they’re rodents. Therein lies Koren’s brilliance: He gets that we need to laugh when we’re hurt, confused, disgusted, worried or simply fed up. And he knows how to picture, literally, the shibboleths, passions, obsessions and, yes, neuroses of this time. SEVEN DAYS: Ed, I first interviewed you in 1995, on the occasion of the publication of your book Quality Time: Parenting, Progeny and Pets. Then you said you’d been doing cartoons for the New Yorker for “an improbable 33 years.” It’s now 16 years later. How has cartooning for the magazine changed since ’95? ED KOREN: It’s become more improbable. It’s a funny subject, because I could sound like a whiner and complainer if I wanted to wax, but I almost don’t want to go there. Much less of my work has been published in the last decade than ever before, and that’s pretty much true for the other cartoonists. It hasn’t changed in that it’s like fishing: You cast your few worms and hope that your judgment will be deemed funny. SD: I think a lot of people read the cartoons in the New Yorker and don’t find some of them funny at all. The magazine is almost notorious for that. SD: Sixteen years ago, I wrote that you were a 20th-century Jane Austen. I’ll have to change that to 21st century. EK: You did? A friend of mine, Rachel Brownstein, wrote a book called Why Jane Austen? I was just reading a letter from Jane to her sister that Rachel quotes in the book [he reads the letter, which includes a snarky comment about an unfavored woman]. SD: She made acerbic observations of people, as you do. EK: Yes. Rachel’s book is really quite wonderful. SD: I know you keep meticulous track of how many of your cartoons the New Yorker publishes. What are you up to now, and how many covers? EK: I’m not sure how many covers, but the cartoons so far are up to 1035. The pace has slowed considerably since 1995. SD: Well, there can’t be too many other cartoonists past the 1000 mark. SD: You told me in 1995 that everything goes in cycles, including “freshness.” How fresh are you feeling these days? EK: By and large, in a general way, I still feel fresh. Since then I stumbled across this great quote from Lily Tomlin: “No matter how cynical I get, I can never keep up.” She is, hands down, a favorite of mine — our sensibilities are so similar. I’m never at a loss for what might be fruitful. There’s an endless stream of peccadilloes. SD: As a writer, I’m always seeing things as potential stories. How does a cartoonist see the world? EK: The way a cartoonist sees the world is that the cartoon is a story. Yesterday, I was driving my son to the trailhead of the Long Trail, and I was noticing people framed in the proscenium of their car windows. It’s interesting: When people drive they are almost always expressionless. So, how do I take what I see in the car window … and find the story? SD: Do you sometimes just start to draw the picture and the text comes to you? EK: Yes, or vice versa. The other day I was riding my bike and thinking about Pride Week — the Chandler [Center for the Arts in Randolph] is having a Pride Week. I came across the idea of a kid thinking that someone’s parents were cool because the father had come out as gay and the mother is bisexual. That’s become part of the conversation. SD: How long have you lived in Brookfield now? EK: This house has been mine since 1978. SD: Ever had any urges to move elsewhere? EK: Yes, occasionally, but as you can see, I haven’t. There are some wonderful things here, and some things I’d just as soon not have. I’m not a content person, but … I’m as content as I can be. SD: And you’re still a volunteer fire fighter. EK: I still am. I may be one of the older guys in the state doing it. There are certain things I can’t do anymore, but there are so many things to be done. The real “pasture” for guys like me is fire police, directing traffic. [Volunteering] is a form of social engagement that I really like — with my buddies in the department and with the public. You often have to be nice to people and calm them down, make them feel better. EK: Yes, I hopped in the [Burlington] marathon for a section. I just love to run, but my cardiologist said it’s not a good idea for me to compete — it makes you push yourself harder than you probably should. SD: I really enjoyed the biking section of drawings in the exhibit. They’re not really cartoons, but they could be. EK: Yes, an interesting question to me is where the line is between the cartoons and some of the drawings. [They’re] pretty similar. The genesis of those drawings is, I love to watch people bike, see how they relate to the machine. It’s one of the few machines you can really be part of, you become one with it. As much as people may like to think they’re one with their SUV, they’re really not. SD: What are you driving? EK: A souped-up old Saab. SD: Let’s talk about this exhibit, which of course originated at the Wallach Gallery at Columbia. I read your essay [in the catalog], but can you share your thoughts about it? EK: At Columbia it was like a homecoming. The gallery is in the old library space in the hall devoted to art history. I spent a lot of time in that library [in college]. What I learned there, in extraordinarily labyrinthine ways, ended up on the walls in that show. SD: That’s amazing. I understand it was a bigger show than at the Fleming. EK: A little bit. It was a much bigger space, so it had a different feel. At the Fleming, the compression makes it almost better; it’s more intimate. David Rosand, the co-curator, agreed with me that it improved the show to be in more intimate quarters. SD: Is it like memory lane when you look at those old drawings and cartoons? Do you think about what your life was like when you made them? SD: Has the opposite been true, as well — that you look back at something and think, Hey, that was really good? SD: When I saw those, I thought, He must have had a lot of fun doing these. The horns are hilarious. EK: Well, I did. This is one of the great joys in my life: drawing. Being at my drawing board, it’s my natural lair. I can’t go away too often because I get a hankering to be drawing. SD: This might be a silly question, given the thousands of cartoons you’ve made, but do you have any favorites? EK: Well, one answer is, how can you choose among your children? But there are a few that I’m really fond of because they seem like a perfect combination of everything I’m trying to do. One is the mice [“Your father and I want to explain why we’ve decided to live apart.”]. It’s a crazy, silly, sad moment of revelation — worlds being shattered, or at least upended, by a few words. But I’ve done these [cartoons] over many years and, once I do them, they’re kind of out of my hands. They take on a life of their own. That’s what happens with drawings: You love them but you can’t be with them; they’re off on their own lives. … The best moment is when they’re being created. SD: It must make you feel good to have a retrospective of them. EK: When I wander around and peer at all my productivity, I think, Jesus, I’ve done all this! I never thought I’d be accorded a gathering on the walls of a prodigious institution. I’m almost kind of naïve, like a kid, I guess. SD: It’s nice to see the cartoons so large and spend a little time with them. EK: The cartoons, they’re consumed in one or two seconds at most. People’s reactions don’t take into account all the thought and work that went into them. They’re not really paying proper respect to everything that preceded it. SD: I know what you mean, writing stuff for a newspaper that goes into the recycling bin the next week. EK: Ultimately, it comes down to This is what I like to do; this is what pleases me. The walls of a gallery give the works more authority. It’s possible to savor and appreciate them, there’s the benefit of time to reflect on what they actually mean, critically or socially or culturally — in a way, to really look at the story that I’ve got embedded in them. Edward Koren, “The Capricious Line,” Fleming Museum, UVM, Burlington. Through September 2. 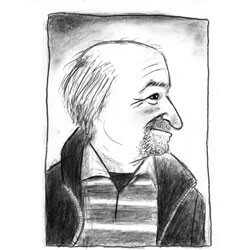 Seven Days asked four prominent Vermont cartoonists to draw Ed Koren in their own styles. Here is what their pens wrought. Alison Bechdel created a long-running comic strip called “Dykes to Watch Out For” that was carried in this and other weekly newspapers nationwide and published in numerous collections. She ceased drawing the strip to focus on books, which include her best-selling Fun Home (2006). Bechdel, 50, lives in Jonesville. Harry Bliss, 47, is a cartoonist and cover artist for the New Yorker and has illustrated nearly a dozen children’s picture books, including the Newbery Award-winning A Fine, Fine School and the Diary of… series. His single-panel cartoon, “Bliss,” is carried in Seven Days and other publications. He lives in South Burlington. James Kochalka is a prolific comic-book artist and writer and front man of the band James Kochalka Superstar. A native Vermonter, his multifaceted work is internationally known. 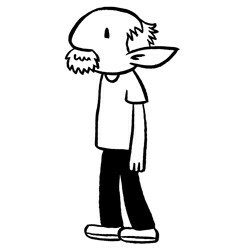 Kochalka’s autobiographical cartoon “American Elf” appears in Seven Days; other strips are available online on a subscription basis. This spring, Kochalka, 44, was named the first cartoon laureate of Vermont. He lives in Burlington. James Sturm is the cofounder of Vermont’s Center for Cartoon Studies and the writer and artist of numerous graphic works. He also founded the National Association of Comics Art Educators and cofounded Seattle’s alternative newsweekly the Stranger. Sturm’s trio of American historical fiction graphic novels includes the award-winning The Golem’s Mighty Swing (2001). Now 46, he lives in White River Junction. Ed Koren cartoons courtesy of “The Capricious Line” catalog.